NEW YORK, NY -- (MARKET WIRE) -- May 15, 2007 -- More prevalent than cancer or diabetes, mental illness ranks first among those causing disability in the United States, with depression and alcohol disorders alone costing employers more than $265 billion annually. 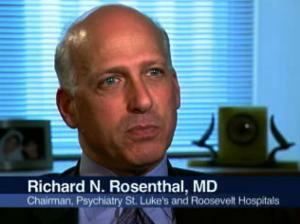 The Department of Psychiatry at St. Luke's and Roosevelt Hospitals will address these issues and more in a live web-cast Tuesday, May 15th at 7:00 pm from St. Luke's Hospital. Aimed at raising awareness among the community of the prevalence and treatability of mental health disorders, the program hopes to de-stigmatize and debunk myths surrounding these issues through open discussion and education. In any given year, 11% of the population, age 18 and over, will<br>suffer from some form of anxiety, while 9% will face a mood<br>disorder such as depression.